Traditional fish finders and depth gauges show depth with a slight delay which means you are always viewing historical data. At idle speed the displayed depth is the depth some distance behind the boat and at speed may be many meters. EchoPilot believes that most boat owners would prefer to see hazardous obstructions in front of them. Several years of intensive research at EchoPilot led to the technical breakthrough which became the Forward Looking Sonar (FLS). Once available only to military and commercial vessels this achievement finally brought Forward Looking Sonar capability within the reach of the recreational boat owner. The first model, the FLS 1, was launched in 1992; there are now thousands of FLS’s in use worldwide. 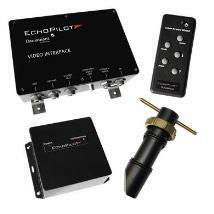 Real-time forward looking sonar is unique to EchoPilot’s patented design. Real-time means that the FLS does not gradually build up the picture like a phased array sonar. Instead the FLS scans the whole forward view and updates the screen several times a second. An obstruction ahead of the boat will show on the screen immediately. Likewise, if the boat turns to another heading with no target ahead then the FLS screen will immediately show clear water ahead. The sonar display is not historical; it is real-time. FLS scans through 90 degrees from straight ahead to straight down In the vertical plane. Think of the FLS like underwater radar turned on its side, and scanning in the vertical plane instead of the horizontal. In the horizontal plane (port-to-starboard) the beam is 30 degrees on 2D models and 60 degrees on the 3D system. 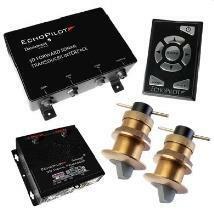 The FLS is a collision avoidance device. 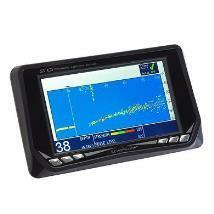 It is not designed to be a fish finder although it may pick up larger fish and sometimes shoals of smaller fish. It also may not detect floating or slightly submerged objects like waterlogged timber, shipping containers or whales. What it will do is accurately and immediately show seabed trends and underwater obstructions. FLS 2D models are supplied with their larger professional transducer. Its flush mount, through hull bronze housing has 3” of usable thread space. The 3D model is supplied with a pair of 5” bronze through hull transducers standard. A 10 inch version for larger vessels with thicker hulls is optional. There are different FLS instruments to cover the needs of a variety of boat owners. From the low cost FLS 2D Color stand-alone model to the top-of-the-line FLS-3D any boater can now have the safety of knowing what lies ahead! The FLS shows a two dimensional profile of the sea bed beneath and ahead of the vessel on either its high resolution LCD display or a separate MFD or monitor, depending on the model. The forward range of an FLS is variable, typically about 10 – 20 times the water depth. For example, in 10 meters of water the FLS displays 100 – 200 meters forward. This ratio increases as the depth decreases or if a large target appears. Rocky bottoms give especially strong reflections and hard vertical surfaces like sea walls or coral reefs will often be seen at 500 feet or more.